Those purveyors of pukka top-drawer video slots, Aussie pioneers, Ainsworth, have come up trumps again with a solid trip into the American wild – Eagle Bucks. The ‘spirit’ of WMS’s America-themed Buffalo Spirit, is here for all to see as we are presented with a beautiful sunset-tinged backdrop to the game screen, while American Eagles, wolves, rock formations, deer and eggs adorn the reels. 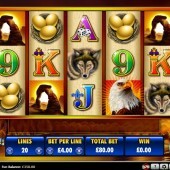 The eagle is Wild in this 5 reel, 20 pay-line slot, and he substitutes for all symbols other than the Scatter. Five Wilds awards a jackpot of 1,000 coins which is not to be sniffed at and definitely worth keeping an eye out for the Wilds. However, pay attention to the Eagle Bucks logo Scatter, as three or more symbols anywhere on the reels activates a free spins round. However, this is no ordinary free spins round – you can either win 10 straight free spins or 10 free spins with an Eagle Wild held on the fifth reel. 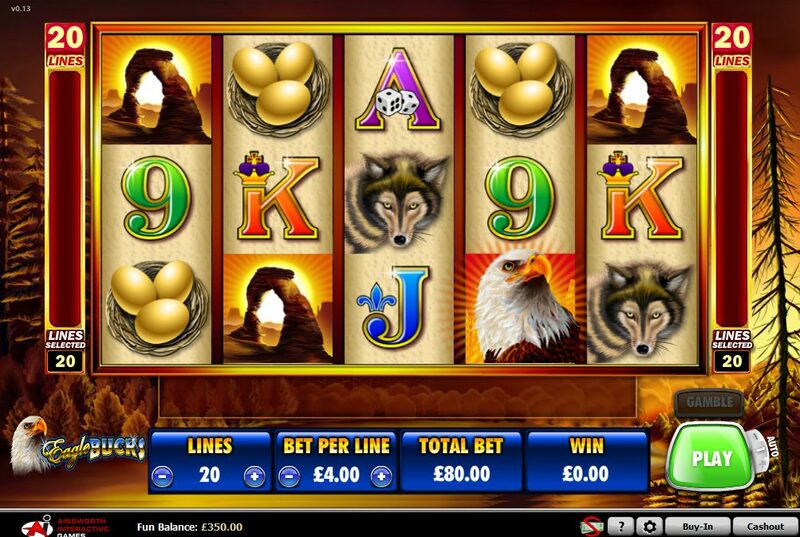 What’s more, you’ll find extra Eagle Wilds flying across the screen during the bonus spins, and if they land on reels 2, 3, or 4, all symbols in all positions on those reels will be replaced with Eagles, bumping up your prize haul significantly. If 10 free spins doesn’t sound too generous, you can bag yourself an extra five free spins if you hit three or more Scatters during the bonus round. There’s no doubt Eagle Bucks can prove to be fairly lucrative if you hit the one bonus round featured in the game. However, I did find those Scatters hard to come by (and there’s not even an autoplay function to speed things along a little). The developers also apparently ran out of budget when they got round to making a soundtrack for it. Having said that, for a tasty slice of land-based casino fare – with eagles - Eagle Bucks ticks most of the slots fans’ boxes.